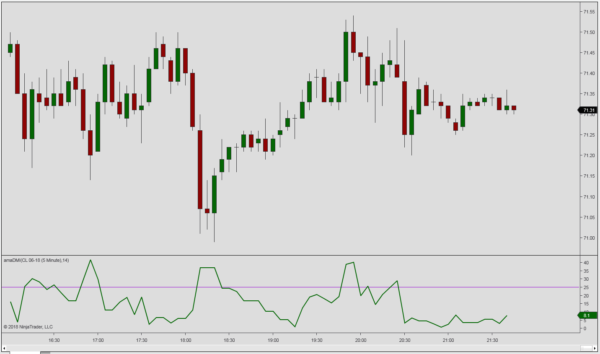 The DMI indicator supplied with NinjaTrader cannot be used with an input series other than price. We have recoded it so that you may apply it to other indicators. To do so, simply select any of the other NinjaTrader indicators as input series. The Directional Movement Index (DMI) measures the strength of the current trend and momentum on a scale from 0 to 100. The indicator is a preliminary stage to calculating the ADX as introduced by Welles Wilder. Low Directional Movement Index values indicate a non-trending market. High DMI values tells us the opposite, a trending market on strong momentum. The DMI is a preliminary stage to calculating the ADX, which is created by exponentially smoothing the DMI.